Dave is the Vicar at St John's. He was born in 1956 in Wales and studied at Wycliffe Hall, Oxford from 1976-1979. Licensed as a Reader in Exeter Diocese, he worked at St. Sidwell's church in Exeter city centre while working as a plater/welder. 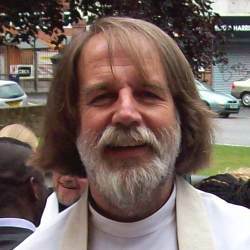 He was ordained in 1981 and his first Curacy was at Skewen in Wales, after which, in 1984, he became Vicar of Christ Church, Thames View, in the Barking Team Ministry. He is married to Carol, who is an Assistant Minister here at St John's. He and Carol arrived at St John's in 1990, when he was made Priest-in-Charge. David was made vicar in 1997 and he is now St. John's longest serving minister. Dave's hobbies include walking, sailing and DIY (particularly maintaining an elderly VW Camper Van). David can be contacted by e-mail at david.richards @ stjohnse15.co.uk.